A Mapuche ruka by 1930. 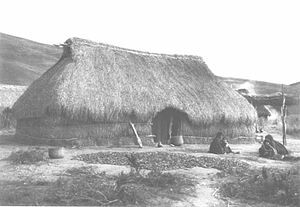 A ruka or ruca is a traditional Mapuche house type. Rukas were originally round with a conical roof. Rucas are typically built communally. This article about a Chilean building or structure is a stub. You can help Wikipedia by expanding it. This Chile-related article is a stub. You can help Wikipedia by expanding it.